More than a dozen new 3D movies are set to hit the theaters this year. If you or your child experiences nausea, headaches or any other symptoms we’ll discuss while watching a 3D movie, consider visiting a developmental optometrist. To understand why, let’s break down how a functional vision problem like amblyopia can impair your ability to view 3D effects. Each of our eyes sees the world from a slightly different perspective. The brain combines these two images in order to see a single 3-D image. If, however, the brain does not combine these images normally, as is the case with amblyopia, your ability to accurately judge distance and see the world in perfect 3D would diminish. This is the case for children with amblyopia, who have one or both eyes that don’t see clearly even if they have prescription glasses. The condition can develop for a number of reasons, the most common causes are eye turn (strabismic amblyopia) and either a large prescription in both eyes or a large difference in prescription between the two eyes (refractive amblyopia). In both cases, the brain doesn’t develop sharp central vision in the eye(s) because it ignores that information through an adaptation called suppression. One of the most frustrating aspects of a lazy eye is that it can be tough to spot. Children with amblyopia don’t know what normal vision should look like, so they don’t realize there is an issue. One of our patients with amblyopia remarked that he thought it was normal that he had a strong and a weak eye because it was like his right arm being stronger than his left! Parents may also be oblivious to their child’s lazy eye, as there are rarely any visible accompanying symptoms. Even so, amblyopia affects the way a person registers depth and dimensionality, including 3D movies. Three-dimensional movies depend entirely on the brain using both eyes together to create their incredible effects. In a 3D movie, two identical movies are projected on one screen, with a slight disparity between the images. The identical images has different colors or polarization, and your 3D glasses will only allow you to see the color or polarization that corresponds to the proper lens. However, the glasses may have an adverse effect on a child with lazy eye. When they put on 3D glasses, the lenses may create a viewing condition in which the brain gives attention to the suppressed, amblyopic eye. Unfortunately, this often leads the eye to strain, resulting in dizziness, headaches and nausea. If the brain continues to suppress the eye, the viewer may not experience these symptoms but will fail to see the movie in 3D at all. Either way, it’s a less-than-blockbuster experience. 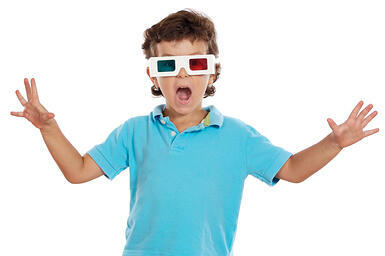 It’s why many of our patients with amblyopia dislike or avoid 3D movies. The following is a list of 3D films scheduled to enter theaters this year. Note that many of these films are targeted at children. If you or your child experience any of the symptoms we discussed while watching any of these movies, schedule a vision screening to determine if it’s a vision problem. If a developmental optometrist diagnoses your child with a lazy eye, vision therapy can help. Through a series of exercises and activities, we can train patients to improve the way in which their brain uses the two eyes together, improving the way they perceive 3D movies and the world around them.